Just a short post to accompany this time lapse video. The painting of the sky should be of interest to a painter having problems with cloud shapes. You know what I mean. The ‘morning after’ you finished your painting, you feel your finally finished, and you are confident it is a good painting. You go and have a quick look before going to work. Ahhhh… the sky is full of – ‘SHEEP’. SHEEP! Fluffy fat ones, demure ones, punk ones, every breed of imaginable sheep. Your lovely clouds, which you painstakingly sculpted the previous evening, have been transformed into sheep!! “W…T…F…”, you say (internally, of course). Mischievous elves, gremlins, jealous neighbours…, someone or thing has ‘got-at’ your painting overnight – you repeat the previous exclamation. Then, the realisation strikes you. You recognise the shapes. Your wonderfully realistic, fluffy clouds are more like sheep than clouds (‘sheep in disguise’ – ‘sheep-in-the-skies’, get it!). Pardon the levity. But I’m entitled to make fun of the situation – I’ve been there, done that. My solution, or a solution which works for me, is to ‘almost randomly’ place cloud shapes and blue sky shapes in the sky area. I’m not mentioning all the other stuff like perspective, light and shade, colours etcetera, that’s another days work, just getting those ‘natural shapes’ you find in clouded skies. By swiping the brush lightly across the surface of the painting, usually diagonally in doth directions, the painted shapes are disturbed in a haphazard way and also blended a bit with the blue. Its not easy and takes practise, but its easier than trying to draw a compositionally accurate, realistically rendered bunch of random shapes that look good. The video demonstrates the process better than trying to explain. Also, check the previous post for materials and other stuff relating to this painting. Here’s the video, watch out for the ‘sheep buster’ at 0:58. 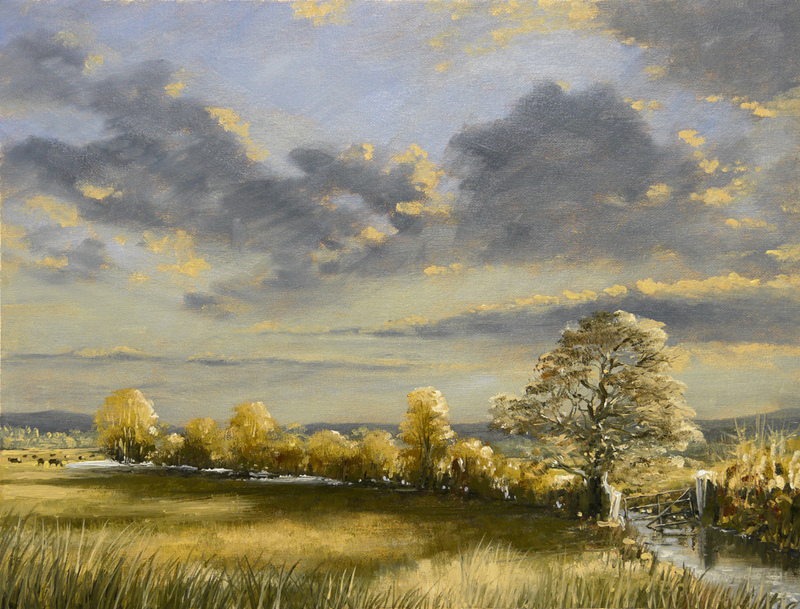 This entry was posted in Oil Painting and tagged Art, Culture, Education, Inspiration, Oil Painting Instruction, Oil Painting Landscape, Painting Clouds, Time lapse painting. Bookmark the permalink. You have captured the beautiful October sky! I love reading your posts and watching you work. Thank you for your comment. I’m fascinated by your American Indian work. This culture is so alien and mysterious to European eyes. Great work and thanks again. Fantastic time lapse! Really enjoyed, thanks! Thank you, I’m delighted you enjoyed. Instead of flowers, my boys give me trees, my favorite flowers! I love your painting.